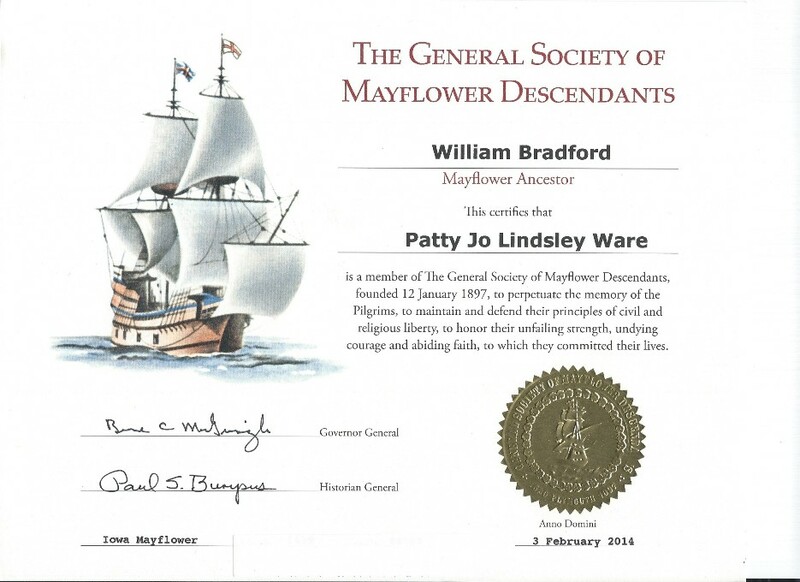 Patty has traced her family history to ten Revolutionary War Patriots and to the Mayflower and she’s still going. She also has established five presidents in her family tree as well as Samuel Adams, Eli Whitney, Buffalo Bill Cody and Winston Churchill. The Revolutionary War patriots include Daniel Lindsley, Daniel Adams, Michael Keith Madden, Charles Meseroll, Philip Mead Sr., Timothy Mead Jr., Leuman Gee, Soloman Gee, Richard Lattin and Col. Ephraim Seelye. The Presidents are Johm Adams, John Quincy Adams, John Calvin Coolidge, William Howard Taft and Millard Fillmore. Also, Gov. William Bradford, the first Governor of Massachusetts was an ancestor and her link to the Mayflower Society. The links above are to her family tree on Geni (1), her story that she wrote on Chronospots (2) and the story of our family which she also wrote, on Chronospots (3). Thankfully she took the time to write about her memories, at Robin’s urging, or a big slice of our family history would have been lost. Many of her friends and family members will be together for the first time in years to honor Theresa. Theresa Johnson passed away peacefully on February 25, 2016 at Tierra Rose Care Center in Salem. Theresa’s life revolved around family and friends. Beloved by family, she had an easy-going, even-tempered demeanor with the ability to get along with everyone, loved animals and babies and had a quirky sense of humor, delighting in playing pranks. Born in Woburn, Massachusetts, her family moved to Springfield in 1932. She attended Brattain Elementary School and Springfield High School, where she played clarinet in the band, graduating in 1943. In high school Theresa began working for the railroad on the first women’s crew, pulling up track between Eugene and Springfield. She earned enough money as a welder in the shipyards on Swan Island to attend U of O for one year studying art. After working as a telephone switchboard operator for five years, she spent the remainder of her life as a homemaker. Theresa hunted and fished, canned vegetables from her garden, and baked bread and pastries. Her artistic flair is evident in the cakes she baked and decorated, floral arrangements, crafts (beading & ribbon roses) and Japanese “bunka” embroidery which she both taught and exhibited in fairs, winning many blue ribbons. She enjoyed traveling to visit family members, spending time at her second home in Florence, playing her lap steel guitar, and was active in the Springfield Moose Lodge, serving as senior regent in theWomen of the Moose. Her final years were spent at Dallas Retirement Village and Rosewood Court Residential Care in Salem. Theresa was preceded in death by her parents, Samuel and Effie Ware; her siblings, Edythe Heintz, Virginia “Ginny” Thompson, Mildred “Millie” Moody, Pete Ware, Dorothy “Dolly” Sweeney and Naomi “Omi” Murphy; and husbands, Aloyisus Koepl, Donald Redfield and George “Jim” Johnson. She is survived by her brother, Frank “Jack” (Patty) Ware and son, Robin (Karen) Koepl, three grandchildren, Lisel, Devin and Brian, and many nieces and nephews. A gathering of family and friends will be held at Virgil T. Golden Funeral Service, 605 Commercial St. SE, Salem, at 1:00 pm on Saturday, March 19. Donations may be made to the Alzheimer’s Association .